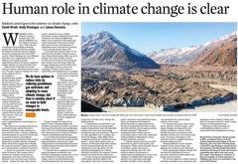 David Wratt is an Emeritus Climate Scientist at NIWA, an Adjunct Professor in the NZ Climate Change Research Institute at Victoria University, and a Vice Chair of Working Group 1 of the IPCC. Andy Reisinger is Deputy Director (International) of the New Zealand Agricultural Greenhouse Gas Research Centre and served as coordinating lead author in the most recent IPCC report. James Renwick is a Professor of Physical Geography at Victoria University of Wellington and served as a Lead Author on the last two IPCC Reports.